Sawatdee from a rainy day here in Ban Non Yang, Yasothon Province. The past few weeks have been very busy and we haven’t found time to update this site. This past week, CIEE students were helping with the Non Yang Food Ways research project, which concluded on sunday with a community forum. More to come on this research project later. April 27-29 brought the AAN’s four regions together in Tamor sub-district for the long-awaited Big Chef Conference. The meeting focused on a few major issues for our national network, and brought farmer-leaders together to exchange about challenges and successes in their local efforts. One major topic was the upcoming Office for Agricultural Reform and Quality of Life – an independent institution which will spend the next 8 months developing a working plan for supporting sustainable agriculture on a larger scale: connecting farmers with organic transition and training programs (inside and outside of the AAN), ending the use of chemicals, and changing government policies on the local level to support diverse production for local markets. After the 8-month research and planning period, the government will decide whether or not to move forward with a long-term agriculture reform ministry or similar type of organization. The Abhisit government is being surprisingly supportive of the AAN and sustainable agriculture more generally. At the Conference, however, our network decided to reject a proposal to sign on to the Farmers’ Congress, a set of regulations and clauses that many activists regard as similar to the U.S. Farm Bill. During Day 1, P’ Ubon (above) reminded the audience that the word gasetagawn (agriculturalist or farmer) came after the use of the word utsahagam (industry). Farmers have always referred to themselves as chow naa and chow baan (farmer and villager), which reflects the ways in which farming is a way of life and a part of rural culture, not just a career in relation to industrialized society. Remembering the terms associated with this cultural identity is increasingly important for small farmers who are faced with the “specialization” of work and loss of traditional knowledge. This line of thinking moves along the same lines as the Spanish campesino movement, which reinforces peasant identity as an important force for change in society. Day 2 featured a presentation from yours truly (farang, above) on the sustainable agriculture movement in the U.S. in the midst of the current economic crisis. I focused on the growth of the organic and fair trade sectors in 2007-08, the progress made by Slow Food, the campaigns organized by the AFF/CIW for food justice and fair wages for farm labor, and I tried my best to explain the Greenhorns “agricultural revival” and the Real Food Challenge, both of which are important youth-led movements for sustainable agriculture and local food systems. Finally, I talked about the significance of the Obama’s White House Organic Garden (which most of the audience already knew about) – here’s to 20 million American’s tending their kitchen garden’s seedlings as we move into summer! P’ Kachai from Focus on the Global South swept in for a late-morning presentation on the relationship between the global economic crisis, the food crisis of 07-08 and global warming and Thailand’s agriculture sector. I won’t go into the details (partly because I couldn’t keep up with many of them), but his talk was mainly focused on price speculation in agricultural commodities and the coming drop in prices. He also gave a clear explanation of the sources of the food crisis (one interesting fact: between 1980 and 2008, chemical fertilizer usage increased from 12 to 112 kilograms per square kilometer). As is the case at many network-wide conferences, these types of presentations help local farmers to develop their own knowledge of global issues and link their communities’ experience to the struggle for alternatives to neoliberal globalization. The next Big Chef Conference will be held in two years. But in the time between, the AAN will work to form a broader assembly focused on sustainable agriculture and health, based in what is accomplished by the Office for Agricultural Reform and Quality of Life. These are important opportunities for the AAN, and we will continue moving forward for positive social and environmental change throughout communities around Thailand. What I’ve learned about Chinese Society. Chinese society has changed faster than I thought. I thought China was a type of socialism, but I now see it’s also capitalist. Industry has developed and agricultural labor is currently moving towards working in industry. This is very similar to Thailand 30 years ago. You have Chinese farmers that think the problem of land limitation is a good thing. Farming means production for self-sufficiency, but if you’re able to find work elsewhere, you can earn a better income. Once you have enough money to build a new home, your thinking begins to change. In this way, China is really entering the capitalist system within state controls. The space between rural and urban Chinese is wide. Pressure on the environment is great because of the expansion of industry. Water is polluted. There are impacts on the agricultural system, as the atmosphere is being poisoned. I got to see the agricultural system and it really worried me. If I were a farmer who ditched my land for industrial work like those in Thailand, it won’t be long before I start to fall apart, because farmers are reliant on resources from outside, they are no longer self-reliant. The amount of seeds, chemicals, pesticides that a farmer must buy are all gradually increasing. They buy seeds every year because they can’t save seeds – so what will farmers be left with in the long term? There is a great chance for Thai farmers to destroy their soil and fall apart financially. Yet one good thing about China is that the state has worked to support farmers and control land grabs. They work to develop farmers’ way of thinking and have insurance programs for food security, and production-focused careers. I’m not worried about China’s role as a competitor in the agriculture sector for the long term, because China is fully pursuing industrialization of their food system. The plan for the Chinese leaders is to develop a policy to become the world’s major food producer, growing domestically or internationally and exporting food, but this will take a long time. 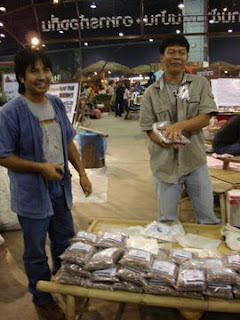 The Alternative Agriculture Network (Isaan) hosted our annual seed exchange festival in Khon Kaen from March 13-14. 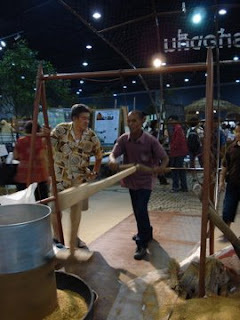 The festival was an engaging gathering of farmers, NGOs and activists from all 4 of Thailand’s regions. It was also an important chance for farmers to swap seeds and stories, or to learn more about what farmers’ groups in different provinces are currently working on. Our solidarity strengthened, the movement continues forward towards more seed preservation and expansion, farmers’ rights and sustainable communities. For Thai readers, please see the Sustainable Agriculture Foundation’s report. Below are some notes from Saturday’s pulic seminars. 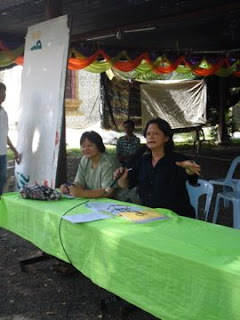 Ajaan Decha (seated, above), of the Khao Kwan Foundation, started the festival’s public seminars with a discussion of the meaning of food sovereignty in Thailand. It isn’t necessarily a question of access to food resources, but the type of resources available. Can we access food that isn’t produced by agribusiness? Chicken, pork, or watermelon? Find a soybean that isn’t a GMO? The answer to these questions is, for the most part, no – unless there are small-scale alternatives available at local markets. The implications of agri-business are important, if not often overlooked – we are being fed chicken pumped with antibiotics and watermelon sprayed with powerful pesticides – and health impacts on large-scale contract growers are becoming more apparent, while small-scale farmers can’t compete. Fortunately, we still have some “rice sovereignty” in Isaan. 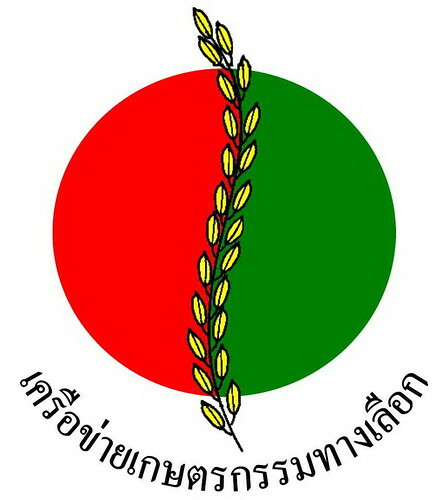 But hybrid seeds produced by Bayer are spreading throughout Supanburi alongside seeds produced by CP in Kampaengphet – and like with Monsanto corn, farmers need to buy these rice seeds every season. In less than 5 years, Ajaan Decha explained, Bayer seeds are really going to take over in Thailand’s central region. A farmer who works with him was forced to plant CP hybrid rice for comparison by the local government, which was at a higher cost and a lower yield. He told the government he wouldn’t grow it if the seeds were free. Yet conventional farmers, when asked to stop using chemicals, respond that they can’t stop listening to advertisements on the radio and stressing about yields. We can’t yet stop chemical advertising or put a tax on chemicals like cigarettes and alcohol, though cancer continues to rise from the use of chemicals in agriculture. While Isaan NGOs have long romanticized about Communism (as some we’re a part of the CPT) and Cuba is a good example of the kind of food system a Communist country can build, Laos proves that Communist countries can destroy food sovereignty much like Democracy. The role of agribusiness is expanding in Thailand’s neighboring countries – another threat to food sovereignty, regionally. The Black Tai people on the Lao-Vietnam border – a community that continues to practice only animism (related to Black Tai groups in central Thailand) – have been brought into the CP feed corn contract farming system. Meanwhile, the community is forbidden to plant sticky rice, as the government controls non-glutinous rice production. Vietnam exported 4 million tons of rice last year (Thailand imported 4 million tons of chemicals and pesticides) and 50,000 tons of rice seed produces 1 million tons of rice – it’s easy for a corporation to control this type of production. Vietnamese production costs are also much lower than Thailand’s and yields are on average 800 kg per rai, compared to Thailand’s 400 kg per rai. Isaan doesn’t have more than 1,000 varieties of rice, though Laos has over 20,000. And 90% of Thai rice has it’s origins in Cambodia. Thai farmers need to continue exchanging with farmers in our neighboring countries to help preserve local varieties. If one percent of all Thai rice farmers saved over 30 varieties of rice, we’d be able to protect rice biodiversity. We need to take traditional knowledge about ecology and biodiversity and resist – globalization only makes us think that we’re stupid or that we don’t know very much. Ajaan Decha continued by arguing that the government’s rice price insurance program was a good idea, but the execution was flawed – the price was too close to conventional rice and rice dried out before it good earn a good price. B’ Bamrung Kayotha (standing, above) responded that the program isn’t real, and that the government needs to dare to help farmers. The program has only benefitted the market and maintains WTO standards. Food is more than just what we eat, it’s impacting society – solving farmer’s problems can’t just be about prices at the mill – we need to look at fairness in all parts of rice prices. In a later discussion, P’ Pakphum Inpaen of Rice Fund Surin Cooperative (seated with Sompoi Chansaeng, above) pointed out that communities are impacted by rice price issues first. We need to find communities that are ready for a new kind of support program and let them manage the government’s funding solution independently. His progressive idea stems from the fact that farmers aren’t just waiting for government support and while forming a farmers’ group to manage budgets or projects, it needs to happen. Personally, I would love to see this kind of project happen – enabling farmers to access funds directly and further empower farmers’ groups engaged in sustainable agriculture and other solutions to the food crisis. Diversity in production can be supported by higher prices. 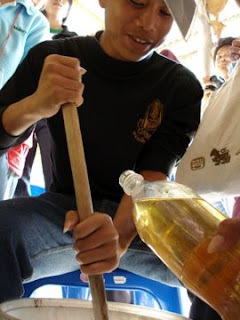 The Wai Sai Hua Jai youth group from Nonyang Village was also making and selling organic rice drinks, made from Red Jasmine and Red sticky rices. Saturday’s rainy weather made selling the warm drink easy and excluding the need to buy a new blender (sketchy electricty at the festival), we pulled in some decent funds for the group. Below, they also gave a performance about the loss of indigenous seeds. Following the festival, farmers’ groups from Northern Thailand visited Kudchum, Yasothon to exchange with the Love Nature Club and AAN. 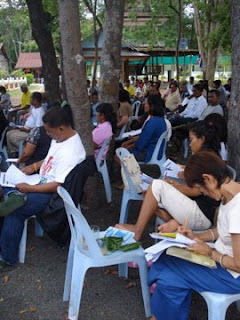 For two days the farmers exchanged regarding seed-saving techniques and experiences in building sustainable agriculture systems. Many of the northern farmers do not yet practice organic farming, so learning with the “Wisemen” of Kudchum was an important learning opportunity. Below, Paw Bunsong talks with P’ Arun and others about the group’s soil improvement techniques. On the morning of the 17th, the Kudchum farmers explained their SRI approach and SRI demonstration paddy. Above, Khanungjit from the Joko Seed Center discusses her experience learning with Paw Taa, who grows over 120 varieties of rice. Paw Taa, along with a large group of AAN-Isaan farmers, visited Joko to exchange about seed saving last November. 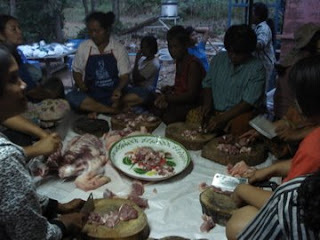 By coming to exchange in Isaan, the learning process between northern farmers and Isaan farmers comes full circle. 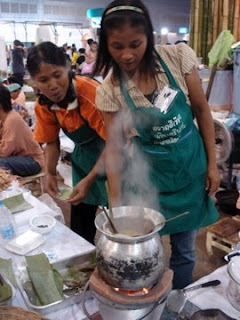 Northern farmers learn about how Kud Hin villagers make noodles from a local rice variety. 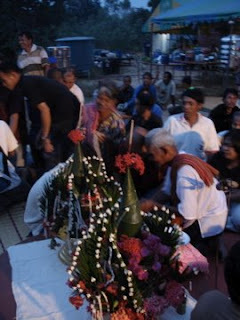 As the Chi river flowed peacefully past P’ Thoy’s home in Mahasarakam province, members of the AAN, representatives from sustainable agriculture groups in Northern Thailand, along with several researchers and professors from Bangkok, met to discuss the current situation regarding indigenous rice seeds, plant protection and farmers’ rights. The conference was also intended to continue building connections between Thailand’s 4 regions, in the lead up to our annual seed exchange, to be hosted in Khon Kaen. While a meeting like this could be held for several days, the day-long conference was jam-packed with panel discussions and an afternoon network-wide exchange. More than seven years ago, the AAN realized that the sustainable agriculture movement had to be about more than organic farming and select ag-related political issues. The agenda expanded to focus of using indigenous or local seeds, to support local culture about food and production, train farmers in proper seed-selection techniques and importantly, resist capitalist seed production and ownership. While Jasmine 105 was blanketing the agricultural landscape, farmers were storing away local varieties to preserve and to eat – maintaining an important connection between culture and indigenous seeds. Seeds within the network have expanded based on annual farmer-to-farmer exchange events, while ideas about farmer’s rights and community ownership have emerged in response to corporate efforts (especially, CP and Monsanto) to use intellectual property rights (IPRs) ownership controls. There are currently 73 farmer-researchers in the network, with over 140 rice varieties saved for preservation and expansion. How do we want to define ownership for farmers? 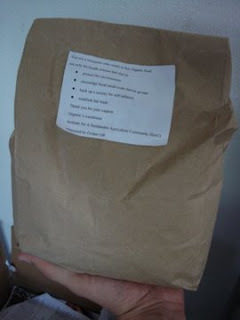 What do the rights to local seeds mean? When P’ Jansee, an SFS member on the farmer-researcher panel (above, with microphone) was asked, “We preserve seeds, but how are we going to use them?” he responded by talking about learning more about consumers’ preferences and SFS’ experiences at our annual indigenous seeds event at the Green Market. As SFS members have built a strong base of indigenous seeds, they can begin tailoring production to the health needs of consumers. If a consumer is concerned about diabetes, they might be interested in Red Jasmine rice, which has a significantly lower percentage of sugar when compared to Jasmine 105 or Gor Kor 6 sticky rice. P’ Lan (above, in striped shirt) a leader in the AAN farmers’ group in Kudchum, Yasothon, continued by talking about the reasons for the loss of indigenous seeds. Traditionally, his home sub-district of Gamet planted 23 indigenous varieties of rice. The market for indigenous seeds, however, disappeared following the expansion of large-scale mills designed to mill only Jasmine 105 or Gor Kor 6 sticky rice and government policy promoted “improved” varieties for surplus production. This production system also minimized feed for livestock, as the crop is planted on all of the farmers’ fields and harvested all at once. After further discussion about the revival of local seeds by the Kudchum farmers’ group, P’ Lan concluded that those who produce and grown must have more ownership over seeds – farmers’ rights. Farmers also need to continue learning about other crops and try planting them out in order to better understand local ecology. Following the farmer-researcher panel was a discussion led by P’ Supa of the Sustainable Agriculture Foundation. We can hold the belief that plants shouldn’t have owners, but this system has changed. The WTO needs to have intellectual property rights (IPRs), as membership depends on it and form the basis for free trade agreements (FTAs). Outside the WTO, the constitution (at least in theory) gives farmers’ communities rights, yet there is a disconnect between policy and reality in communities. Later during the discussion, one farmer passionately proposed that property rights should be done away with. He got a quick response: commercial seeds have already destroyed many farmers’ rights. Geographical Indication (GI) is an alternative to IPRs – it allows farmers to freely plant registered seeds, but not use the registered name. Yet there aren’t seeds that are specifically able to be planted in one area. If someone develops a new breed, sure they should have the right to register it – but are they really creating anything new? Registration or protection is about indigenous genetics, not a tool for corporate exploitation – yet it’s also about allowing other farmers to benefit from local resources. Finding a balance in protection and use is our network’s challenge. Saving seeds in order to plant them again is a farmer’s right. Selling locally and exchanging are also farmer’s rights – local resource management sovereignty – and power is mobilized for rural communities, in order to come up against the conventional system. This was all building to a network-wide statement in the afternoon discussion/brainstorm (Ubon Yuwa, exchanges with P Wan, of the Joko Learning Center in Nan province). Plant genetics are of natural systems (also legal). Property rights become an issue when the seeds farmers produce are taken by a company and we need to register our seeds with them – as is the case for rice seed breeders in Southern Vietnam. The urgency of the conference stems from the reality that seed companies are developing new varieties to create new markets – it’s not about improving efficiency for Thai farmers. In response, what is the network’s reaction? Create some kind of a law for farmers’ way of life, to protect their local resources? Create a new level for community rights, for local resource management? What is the genetics system that we are looking at? Preservation or expansion? How do we manage new breeds? P’ Thoy responded: our [AAN] type of agriculture isn’t about making money – we need to make a clear separation for ourselves – but what is keeping farmers from thinking they can be their own seed breeders? Given the success of the National Health Assembly and our network’s strong working relationship with public health efforts in Thailand, a seed assembly is possible. But clearly, a lot of things are possible, and the day’s conference in Mahasarakam was far from conclusive. It got farmers and NGOs thinking about next steps, and as we build our own bank of indigenous plant material, being able to engage with trade policy or IPRs with farmers’ dignity and knowledge behind the movement will be essential for protecting our interests and supporting others who may not yet have access to good seeds. I made it up to Kudchum, Yasothon province for part of the Nonyang Village Organic Learning Center’s “Youth Session” on the weekend of March 7-8. Below are some photos and notes from the events. There were youth in attendance from Yasothon, Mahasarakam, Roi Et and Kalasin provinces – mostly high school students (many of which are about to finish school and begin looking for employment). 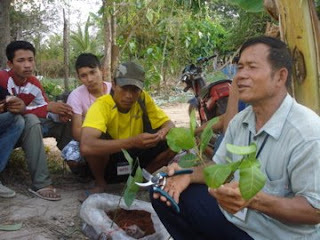 The goal of the weekend was to teach the youth groups about organic farming as a career, introduce a few different techniques, and motivate the youth to continue with group activities or campaigns related to organic farming – like those of the Kids Love Nature group in Surin or Wai Sai Hua Jai in Yasothon. Thanks to P’ Breeo and Udee for inviting me to join in on the fun! 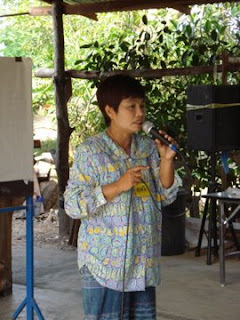 Mae Tanai kicked off Sunday’s activities with a brief talk about her experience of becoming an organic farmer. She had worked in Bangkok for a number of years before coming home to pursue a new career at home in Mahasarakam. She pointed out a number of valuable things, “farming is the basis for a secure livelihood and freedom. We all have 24 hours in a day – but it’s up to us how we use them. We have a choice to pursue the labor market, but given the economic crisis, I believe that farming is a better alternative.” I think her words got everyone thinking before we went out to spend our remaining 12 hours learning more about organic farming. The group was split in two before heading out to Paw Taa and Paw Noi’s fields. 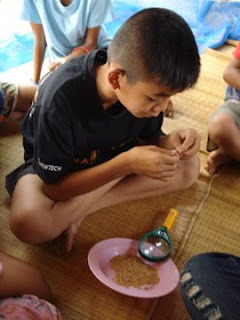 With Paw Taa, each group learned about rice seed selection and SRI planting methods. 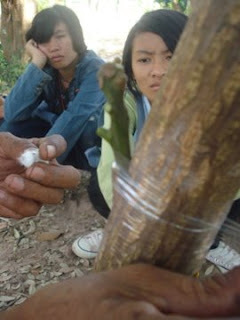 With Paw Noi, they learned about various grafting and tree pruning techniques, including Dragonfruit, Mango and Longan. 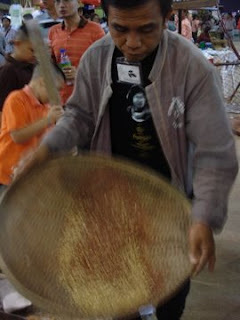 Nu, from the Wai Sai Hua Jai group, picks out the best rice grains for seeding. The kids used magnifying glasses to see the characteristics of each grain more clearly – especially the “nose,” where the roots will eventually emerge. 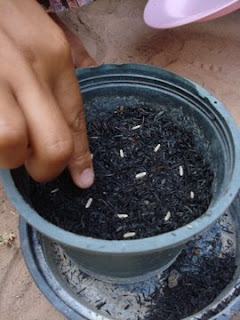 Having selected the best seeds, they are planted in a burnt rice husk mixture and watered for about 2 weeks, until they are ready to be planted in the paddy, one seedling at a time. 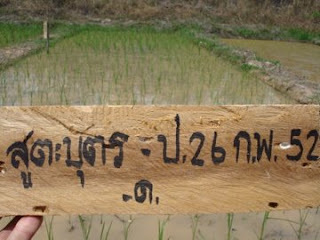 Below, 20 day old seedlings in one of Paw Taa’s dry-season, seed-saving paddies. Over at Paw Noi’s fields, Paw Lurn and Paw Noi gave the group a lesson on Dragonfruit grafting, Paw Jong gave a lesson on Mango grafting and Paw Anon taught about rootstock grafting for Longan. There are three main varieties of Dragonfruit, based on their white, yellow and purple colors. March and April are their fertilizing months – male plants tend to be wider, female plants more narrow – and they pollinate during the evening time. 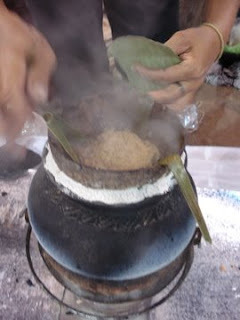 Udee ties on the coconut husk mixture that will create a micro-environment for new Longan roots. 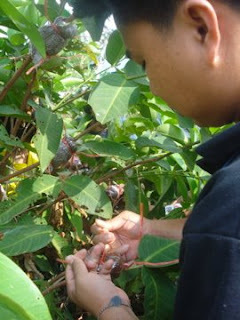 The Alternative School project at Jalurn Suk School also practiced this back in October, with Guava trees. The afternoon’s sessions were definitely educational, but I think the kids were pretty hot and tired by the evening. Thankfully, a big dinner-tasting/party was in the works for that night and everyone had a lot of fun. Each meal was presented based on the homes that the kids stayed in, and they got up in front of everyone and explained where the ingredients came from (unfortunately, the cookies were purchased), how they were produced and then gave a short advertisement for their dish. Afterward, we all shared the food together and had a little jam session with music and drama performances. While it’s hard to expect rural youth to jump right into organic farming for their career – especially given family situation, inherited debt or other obligations – activities like the Youth Session are important ways for kids to learn more about self-reliance and the alternative of organic farming. A lot of the youth in these groups may go right to Bangkok and work for a few years, or spend most of the cold and dry seasons working in different hired labor jobs. But when they come home to support their parents or begin a family, farmers’ groups within the AAN feel it’s important to teach them about the community-based opportunities provided by organic farming. I applaud the youth-focused work of P’ Breeo, Udee and their student team from Mahasarakam – it is essential in the effort to bring young people into Isaan’s movement for sustainable agriculture. Plus, they are just really good at what they do and understand clearly where rural youth are coming from. As we recently wrote on our decision to relocate, this past Saturday marked both our first day at the new spot and AAN-Surin’s annual indigenous seeds event. The space is roomy and set back from a busy intersection, which brought in a lot of new consumers. People can walk more easily from vendor to vendor and vendors are able to spread out over the space. Though the crowd had thinned out by the afternoon seminar, the day’s events were definitely a success: we moved the market and the consumers followed us, and new consumers got to learn about what our movement for sustainable agriculture is all about. The event was co-hosted with the AAN, with representatives from Kalasin, Mahasarakam and Yasothon provinces coming with information, herbal and handmade products, and importantly, seed samples to display and distribute. There were more than 40 different indigenous varieites on display! Beyond the distribution of dangerous and ineffective chemical fertilizers and pesticides, the Green Revolution’s promotion of Jasmine 105 (which has made Thailand’s rice exports famous) effectively wiped out a number of local rice breeds. Middlemen and large-scale mills, established to process only a few “market-able” rice breeds, would not accept the small grains of locally-bred varieties. Our network has worked to reclaim a number of varieties, both through local conservation efforts and regional seed exchanges, as well as demands for the return of seeds from government research centers to the farmers themselves. The goal of last Saturday’s event was to provide more information for consumers about the diversity of local rice seeds we have here in Surin and the Isaan region. 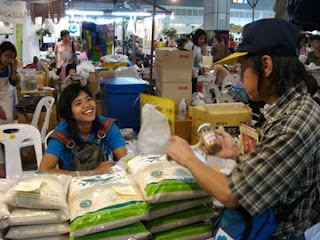 The popularity of Hom Nin rice, a black Jasmine variety, has also proved the viability of a market for local varieties. We presented six different varieties for consumers (photo below) to sample and compare – this input will help farmers decide what varieties to expand for local market sale, direct to Green Market consumers. After a lunch served with a local red Jasmine rice variety, we hosted a bai see ceremony for all the fruits, vegetables, seeds and seedlings presented to make merit for the coming rice planting season. 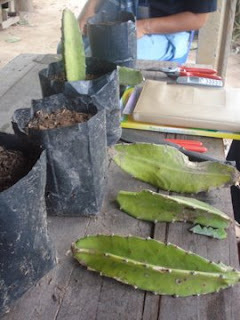 Once the ceremony was over, producers and consumers came to pick out the seeds they wanted to plant. The afternoon also featured a seminar hosted by P’ Ubon Yuwa (photo below, far right), with Rice Fund members P’ Bresong, P’ Jansee, Paw Ota, P’ Batipat and P’ Pakphum (photo below, left to right). All of these farmers are what we consider “farmer-researchers” as they work independently to preserve and breed local varieties for increased production (last month’s exchange with the Southern AAN members and researchers from the Patalung is an example of how their village research center works). Their work with SRI techniques is the basis for their seed saving efforts – preserving the highest quality plants season after season and distributing to other farmers in their communities to plant. Given the dominating presence of Jasmine 105 here in Surin, the seminar focused on different issues and ideas relating local varieties to the conventional system. Their discussion also touched on climate change and the future of consumerism. A diversity of indigenous seeds forms the basis of a farmer’s sustainable practice – they are central in making farm plans. When a farmer can plant a range of light and heavy varieties, they will ripen at different times of the harvest season, enabling family labor to manage the crop (Jasmine 105, however, will ripen all at once, requiring hired labor or harvesters). For example, some low yielding, light varieties can also be fed to cattle, as they are harvested early in the season and thus enable cattle to be raised in the paddies. Green manure crops can also be planted following the harvest, capitalizing on the moisture contained in the early cold season soil. In this way, local seeds represent the culture and way of life of small-scale farmers. There is no perfect seed – farmers need a range of indigenous seeds that can withstand environmental change and when they plant them, they are prepared for unexpected weather events like drought or flooding. P’ Batipat, who has been involved with community-based climate change research, emphasized that global environmental change was something we need to learn a lot more about, he mentioned “This year’s winter was a long one. In April, we’ll need to be ready for the rains, but the months following in the rainy season have become increasingly irregular.” He also pointed out, “We need to change how we think about farming, and be prepared for environmental change with biodiversity.” By creating in-depth plans for each season, we can engage and inform ourselves with the ecology around us. The research network he is a part of is predicting a lot of rain over a short period of time at the start of the rainy season, then a long drought, and then more rain and potential flooding (much similar to the past year’s rainy season). Given the various uses and community-based value of local varieties, these farmers got to thinking about how to get them back and planted again. P Jansee himself plants 19 varieties. A number of local varieties have greater nutritional and health benefits than Jasmine 105. It’s also commonly said that eating local varieties “makes people’s stomachs full,” providing more energy for work in the fields. 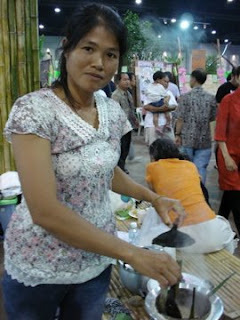 Sticky rice is used in making treats and snacks, while heavy varieties like Nieung Guong are better for making noodles. A type of black sticky rice, called Kao Gam, has medicinal properties that help improve vision. Red Jasmine is known to be very low in sugar, which would be suitable rice for people concerned about diabetes (a growing crisis here in Isaan). Vendor: What would you like? Consumer: How many times have these vegetables been washed? Consumer: Where do they come from? Is there any industry in that area? What kind of fertilizer is used? Stable manure or fermented compost? Where do the seeds come from? Are they GMO? For a Thai commercial, its cleverness is pretty standard. But the content speaks to the possibility for a big shift in consumption. Obviously most consumers don’t ask these questions when getting their lunch, but we need to start. In the future, we may be able to promote different indigenous rice varieties for the health concerns of different consumers. 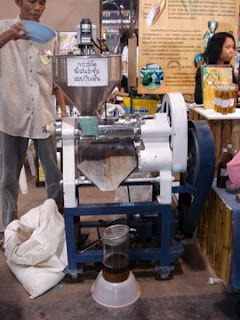 As P’ Pakphum pointed out, “It’s time that people should consume information about what they eat – for their own health and for change in our society.” Awareness is increasing and interest in local foods and local varieties of rice can only be supported further by producers’ diversity in production. In yesterday’s first post I wrote about the recent visit with farmers in Roi Et province from Slow Food Italy. This past weekend, the Yasothon Green Market hosted it’s first public event since it’s opening, which included elements of Thailand’s own Slow Food movement. 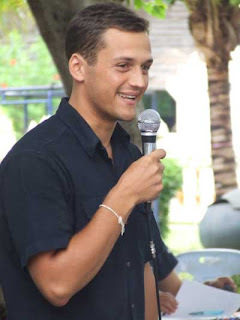 The day was part Youth Food Movement, part Slow Food Taste Education, and part public, environmental health discussion – all intended to further engage the Green Market with the public. This included a street demonstration organized by youth groups from Yasothon, Mahasarakam and Kalasin provinces (photo above); a local food tasting competition and presentation featuring 4 local youth groups; drama performances from Mahasarakam and Yasothon youth groups, and several discussion forums on local food, climate change and healthy consumption. Like our market here in Surin, the farmers’ group in Kudchum district, Yasothon province is working to create new connections between rural and urban communities. By focusing on issues like health and climate change, farmers hope their market will have greater appeal to urban consumers. But the concept of Slow Food may also be something consumers can catch on to as well, as many Thai people still buy fresh vegetables from local markets and prepare foods at home. Though local markets may seem wholesome and a better option that superstores like Big C or Tesco, these markets have become subject to the market-control mechanisms of large-scale producers and corporations. The Green Market provides a stark contrast to the cities’ main market, which is just a few blocks down the street and filled with produced delivered from far away provinces or imported from China or Laos; with crowded pathways between vendors’ crammed stalls and fish being butchered as motorcycles squeeze through, spitting exhaust fumes from their tailpipes. In addition to being clean and accessible, the Green Market’s vegetables cost the same as the conventional produce at the main market, but are sold directly by the farmers themselves, and consumers comfortably walk between stalls to talk with vendors. By providing safe, healthy and organic vegetables every Saturday in the city’s downtown, farmers are actively creating a small-scale, local food system. The market is only 7 months old, opened with the support of ciee students in the spring of 2007. Engaging such new spaces with the public also takes the support of local politicians and public health officials. The mayor was invited to provide opening remarks, in which he spoke about the importance of safe, local vegetables for the health of urban people. Afterward, he toured the market with Man Samsee and Bunsong Matkhao, leaders in the Kudchum farmers’ organizations. Below, the mayor has a taste of a brown rice drink, a sweet, healthy food made from organic rice bran. The day’s events had a very solid turn-out from farmers’ groups around the province, but consumers were lacking by the afternoon’s forums. The challenge for food and agriculture activists in Thailand is to make concepts like local, fair, slow and organic appealing to consumers, who tend to focus mostly on the price of food, especially in this economic climate. This gives an unfortunate advantage to agri-business corporations, who are able to provide food cheaply and in large quantities (but at what cost to small-scale producers and the environment?). Providing small Green Markets like those throughout the AAN is an important first step – the next one is to provide information for consumers that will enable them to make educated decisions about where and what to buy. Groups and networks can then form to support the work of NGOs and small-scale farmers groups. During the youth demonstration, we invited the local CP animal feed shop (photo below) to the Green Market, but we never saw anyone from the shop stop by. The beautiful posters below were put together by Biothai, the Sustainable Agriculture Foundation and Slow Food Thailand. These are great tools for engaging with folks who came to the market simply to buy some vegetables. They provided recipes for local dishes, information about local plants and their health benefits, and the story of the Kudchum farmers’ group to organize campaign information. Slow Food Thailand is a new effort organized by a coalition between the AAN, Biothai, and the Sustainable Agriculture Foundation. 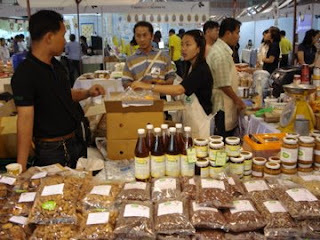 Like other convivia around the world, Slow Food Thailand works for the defense of biodiversity, taste education and creating connections between producers and consumers. In the photo below, a local dish called nam thok was presented in the taste education/competition event, which is made by using the juices of the grilled chicken and covering and mixing them with fresh scallions, shallots, mint, cilantro, basil, chilies and ground, roasted rice grains. Really delicious! 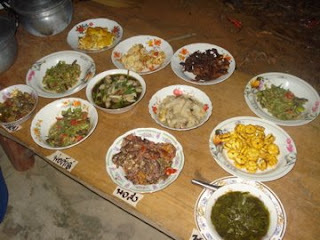 The dish is usually eaten with sticky rice, common in the Isaan region. There are currently ideas to begin a “three seasons” campaign in the northeastern region, which will focus on the foods available during the wet, cold and dry seasons. Their website will be officially released later this month. Vendors also brought seeds (coriander, cilantro, scallions) and seedlings (scallions) to be planted by “co-producers” (consumers). This is yet another way to create real relationships through sustainable consumption, as those who buy the seeds (saved by the farmers themselves) can ask about preparation, planting and care – possibly even exchanging their produce with the vendor who sold them the seeds in the first place. Like the tomato and lettuce seeds planted by P’ Then Jaengsanam in Roi Et, exchanging and saving seeds is both a symbol of Slow Food’s defense of biodiverty and helps build the basis for Slow Food’s international and local movement. Food is meant to be shared and enjoyed, and this past Saturday’s event in Yasothon was a solid start to building another local food community in Isaan. While direct trade is becoming popular among small-scale coffee producers and independent roasters in the U.S., the term is taking on a meaning of it’s own here in Northeastern Thailand. It may be the case that direct trade is more beneficial to coffee growers in the Global South, but only time will tell. Fair Trade has already accomplished a lot for small-scale producers’ groups and perhaps direct trade is a next step. It would be a shame for direct trade to be something that competes with Fair Trade for socially-responsible consumers, given that both approaches are working towards similar goals. Yet this post isn’t meant to be a discussion of direct trade vs. Fair Trade. Fair Trade continues to be the standard for international export with rice farmers’ cooperatives here in Isaan, but domestic, direct trade is coming to be seen as a new option for organic farmers. We recently visited with the Non Yang farmers’ group in Kudchum, Yasothon Province, who are now selling their organic rice directly with a network of consumers in Bangkok. The farmers’ in Kudchum are also members of a Fair Trade certified cooperative, which exports to European markets. But this new form of direct trade, in which the famers use a small, community-operated rice mill (photo above), package and ship rice directly to urban consumers, may prove to be a valuable way of generating additional income. This approach is like a combination of direct sale and Community Supported Agriculture (CSA), though the consumers’ network is facilitated by the Sustainanble Agriculture Foundation in Bangkok, and farmers are currently only selling rice to within the network (vegetables are sold locally at their Green Market, a program similar to ours here in Surin). As fellow members of the Alternative Agriculture Network (AAN), we support their domestic direct trade efforts. While Rice Fund utilizes the Kao Hom store here in Surin, our network needs to develop a diversity of ways to reach urban consumers. We need to reach people in our local, urban communities through green markets and educational campaigns, as well as consumers in large urban centers like Bangkok. Expanding alternative markets can help prove the viability of sustainable agriculture and fair systems of distribution and consumption. P Ubon Yuwa (photo above, center, with a Non Yang farmers’ group member) said during our visit to Kudchum, “Thai people are like frogs, waiting in the water for their food to come – It doesn’t matter what it is. 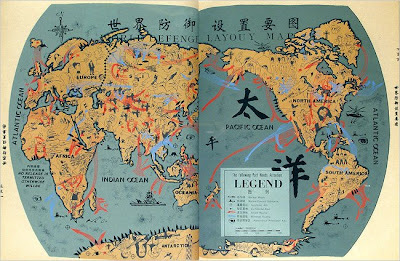 We eat food from far away, we don’t know what was sprayed on it or how it was produced. The little fish we like to eat, they all come from Laos.” At first thought, a statement like this might make one doubt the future of Thai consumerism, but the growth of alternative systems like domestic, direct trade, organic shops and green markets indicates a new type of consumption. Thai people are increasingly concerned about their health and the way their food was produced – this concern can be tranformed into confidence through continued support for alternatives and efforts by the AAN to continue educating the public about our food system. Above are some photos from our visit. The Non Yang farmers’ group has opened several training centers to teach organic farming techniques, and their fields are models for year-round vegetable production. Though there are about 400 families in the village, only about 20 families practicing sustainable techniques. In turn, the majority of villagers buy cheap vegetables from local markets year-round, though they are otherwise able to produce local varieties vegetables themselves. Older couples remain self-sufficient, but the eating habits of younger kids tend to focus on chinese vegetables bought at the market. While one might think that buying vegetables at a local market is not such a bad thing, the problem is that these preferred vegetables – like cabbage, different lettuces, and chinese kale – are grown year-round using significant amounts of dangerous pesticides and herbicides (though monocrops grown in season also require spraying). Many of these vegetables are also produced in other regions of the country, or imported from Laos or China. Recent blood testing showed that 70% of villagers had unsafe levels of chemicals in their blood. Yet some villagers maintain, “I’ll keep eating delicious food until I die.” Cheap, non-local vegetable continue to go fast at the market and trucks and motorcycles continue to deliver them right to villagers’ homes. Beginning next month, SFS will be collaborating with the AAN to support a local food research project in Non Yang village. We plan to work with the community’s youth group to make a short, documentary film about local food and village consumption as well as organize a group of villagers to ecducate and exchange about these issues. These efforts will be directed at creating a plan, a food alternative for villagers. The project will certainly be challenging, but as Non Yang’s experience with direct trade and urban consumers in Bangkok – and the success of green markets, regionally – we can develop a process to educate farmers about consumption and create change within the community. Thursday morning brought 40 cold, yet encouragingly excited farmers and researchers from Patalung Province, Southern Thailand to the sala in Donlengthai village. This week has been the coldest all winter and certainly a tough time to come for a group of people used to 80 degree weather all year-round. As members of the Alternative Agriculture Network (AAN), they came to learn and exchange about rice seed-saving and planting techniques with farmers from the Tamor Natural Agriculture Group, who are also AAN members. Over the past two seasons, SFS members in Tamor have gained a lot of experience using SRI techniques in growing rice to preserve specific varieties and expand others for sale. The first session featured some instruction from P Jansee on SRI basics (using our new whiteboard!). After a coffee break, we moved things outside and into the sunshine, exchanging about each group’s experiences with seed-saving and organic certification processes. Providing information for the Patalung farmers’ group about organic certification was an important part of the exchange, because when farmers can clearly and confidently explain such a time consuming and involved process to other farmers, knowledge and confidence can move quickly into action. The Patalung farmers’ group is already pursuing organic techniques, so the next step is to approach certification. P’ Yae and P’ Pakphum (in the above photo) also had a lot of great information and thoughts to share with the group. One thing that P’ Yae said really stood out: “saving rice seeds is important because they are community property; they are farmers’ property. This issue is about Intellectual Property Rights and creating a base of information and records of our work and knowledge. Companies have a right to Intellectual Property, but owning this information about rice seed varieties can help if companies try to claim it.” The threat that agro-industrial seed companies like Monsanto pose to small farmers is a real one. Given a double net income on seeds in the last quarter, Monsanto will continue to look for markets to control and other seed companies will follow in competition. If farmers are unable to protect the genetic diversity they’ve created in their own fields, who’s to say that their fields won’t become another extension of the mono-crop (increasingly GM) “free market” of agro-industry? Given this context, it is increasingly important for small-scale farmers’ groups like the members of SFS to have the ability to grow and save local varieties of rice seeds. Farmers in the AAN will continue to exchange knowledge and seeds in order to create a strong alternative to the corporate-controlled system that is expanding throughout Thailand. Happy New Year 2552/2009! SFS is now back to work after a little break for the holiday. This post features the visit from the Thai Health Promotion Foundation on December 19th. The Foundation – referred to as ส.ส.ส. in Thai – is one of our biggest supporters, and this was their board of director’s first visit to our organization. After a morning meeting that introduced some of our programs in more detail and invited feedback from our visitors, we took our 30 visitors out to Tamor subdistrict to meet with some of our members. The morning also featured our “Farm to Market” video, which got everyone excited about visiting the farms. The afternoon trip to meet with farmers answered a lot of their questions and was a great opportunity for the farmers themselves to express their ideas and experiences in sustainable agriculture. Lunch in Tabthai featured Kanya Ongsri’s organic pork and Tilapia, which everyone enjoyed especially after getting to see her fish ponds and pig pens. The Foundation’s support for the work of NGOs like SFS represents a truly progressive approach to public health. They view sustainable agriculture – which includes organic farming practices, rice seed saving and programs like our “Smiley Garbage” – as deeply connected to the health of Thai citizens. While the Foundation is probably best known for it’s anti-smoking campaigns, their support for sustainable agriculture, especially in this part of Thailand, is an important part of their vision. They understand that a small-scale farmers’ ability to provide safe, healthy food for his family as well as the local community is an essential part of Thailand’s public health infrastructure. The value of SFS’ work is something best understood when you can exchange about it directly with a farmer. Coming to their fields and learning about their techniques, seeing that no chemicals are used and the local ecology is conserved, is an important educational experience, even for the most experienced public health workers or doctors. I think the photos below do justice to everyone’s feelings when getting to step into Samrat Thong-iam’s fields a few weeks ago. There is something really beautiful about people coming together around safe, healthy food. Maybe this time has to do with everyone coming together in the fields in which it is grown, or that some of those people are instrumental in generously supporting small organizations to enable more farmers like Samrat Thong-iam to pursue a sustainable livelihood. SFS looks forward to a new year of working together with the Thai Health Promotion Foundation. Together, we’ll continue building alternatives for small-scale farmers and urban consumers. 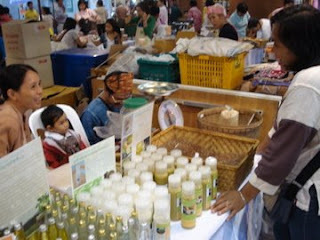 We’ve just returned from a week at the Herbal Festival, an event hosted by the Health Promotion Foundation in Bangkok. The festival was held in a big convention center called IMPACT and there were vendors from all over the country selling herbal products and food. 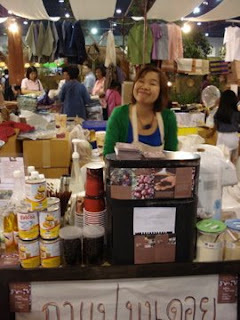 We managed a booth that sold over 1,500 kg of rice and made delicious snacks unique to Surin. Our Kanom Nieun and Kao Thoo was made from local coconuts and Red Jasmine rice – the customers loved them and our vendors were busy the whole week. 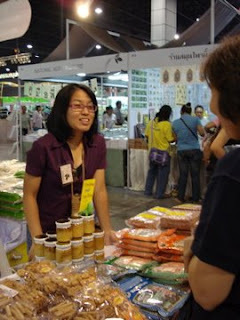 The festival was also a good update on the preferences of Bangkok consumers. Though the festival was more likely to attract people concerned about their health, we found that our Red Jasmine and Whole Grain Jasmine rice sold really well. We had to ship a few sacks down from Surin halfway through the week just to keep up with part of the demand. 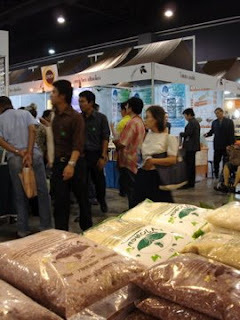 It was also useful for a lot of our customers to see the Organic certified label on our packages, it assured them of our standards and high quality – the product spoke for itself, we mostly spoke with customers to introduce the Rice Fund Cooperative as well as any specific information about cooking or storing the rice. We also brought samples of the rice varieties we are currently preserving and expanding through SRI techniques – one customer chatted with Aen about the history of Basmati rice for almost an hour!! Our booth was set with a few other NGOs that are close friends with SFS, including Bon Doi organic coffee from Chiang Mai (which provided us with plenty of fresh espresso throughout the day) and Ban Rai Din Dee Jai, an organic farm which makes natural soaps and creams. This direct, short message is profound because it explains to consumers the values behind the product they purchase and tells them that they are supporting local, green and fair trade by doing so. 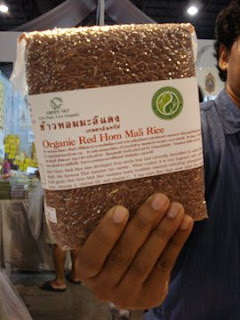 A package of Red Jasmine rice sold by Green Net did something similar, providing information in English about the health benefits of organic, whole grain rice and writing a short message about Fair Trade in Thai, on the back of the package. Our brothers and sisters from the Alternative Agriculture Network (AAN) Isaan were also in attendance. Below, farmers from Kudchum, Yasothon show the seed varieties preserved by the network and hand mill Red Jasmine rice with people visiting the festival. 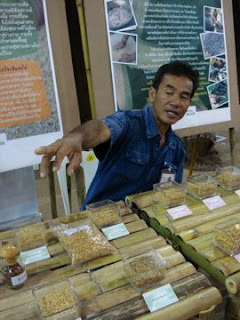 Kalasin also had a number of local sticky rice varieties that were hand milled and sold in 2 kg bags. Lastly, the festival was a time of reunions. SFS and Rice Fund was “reuinited” with it’s rice bran press, which was ordered in July but has yet to be delivered. Following the festival, Rice Fund will recieve the press, and begin making it’s own organic rice bran oil, which can be sold as a replacement to conventional cooking oils. 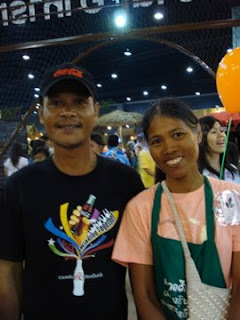 More importantly, two of our vendors were reunited with family members who are working in Bangkok. Ae got to visit with her older sister, who helped sell snacks and Samrieng got to visit with her younger brother, who works as a driver for Coca Cola, but had the day off from work. Rice Fund Surin hosted Friday’s Alternative Agriculture Network – Isaan (AAN) quarterly meeting. The meeting was made up of groups of farmers and NGOs from 8 provinces (Roi Et, Ubon, Yasothon, Mahasarakam, Khon Kaen, Kalasin, Petchabun and Surin). The morning session focused on network mechanics, the responsibilities of the network committee’s 25 members and the re-appointing of Bunsong Matkhao as president of the network. The AAN is critical of this policy-making direction because of the corporate pressure and control that is already exerted on the biofuel industry, the environmental degradation that is occurring in other developing nations around the world as a result of intensive biofuel production, and the threat that expanding monocultures have to the small-scale biodiversity that organic farmers in the AAN are working to generate. Beyond discussing these political issues, the meeting distributed information to AAN members for local seed saving projects. Above, Presong Seesa-Ard and Arat Saengubon review the most updated seed saving and management materials for the Tatoom farmers’ group.